The character half mask of Alcemena was created for the play, Amphytrion by Moliere. 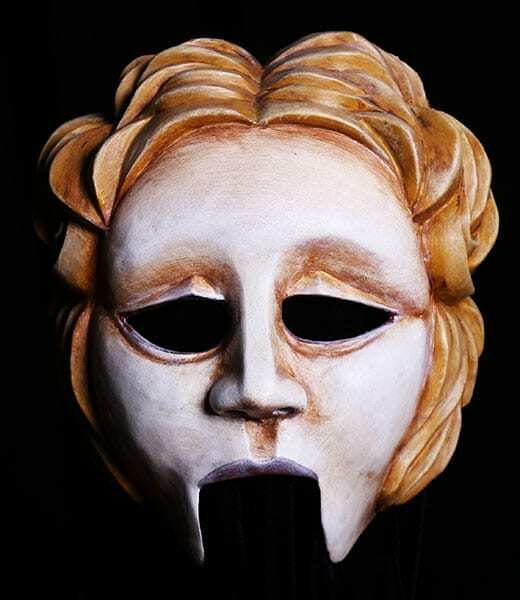 The design of this mask was heavily inspired by greek theater masks and would be a great addition to a greek tragedy or comedy. Alcemna is the wife of Amphytrion and the mother of Hecales the son of Zeus. She is woman of beauty, wisdom and power unsurpassed by others of earthly parents. Amphytrion loves her and is betrayed by her. This mask would be a great addition as a mask for schools, colleges and universities as classroom equipment for the training of actors.